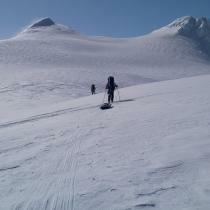 The Atlin to Juneau Icefield Traverse is a a multi-day ski traverse from Atlin, BC to Juneau, Alaska. The route follows along six different glaciers (Llewellyn - Matthes - Taku - Southwest Branch - Lemon Creek - Ptarmigan) for a total of 109 km. 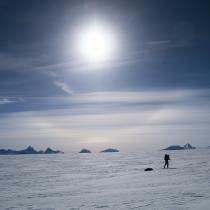 Prepare yourself for numerous days of nothing but snow, ice and rock as you travel across this huge landscape. 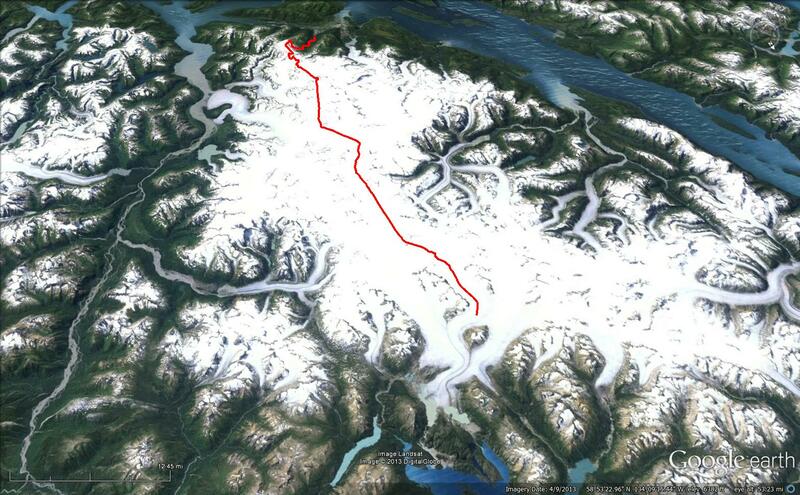 The route described here, including distances and duration is based on flying onto the Llewellyn Glacier from Atlin, skiing across the icefield, and descending via the Lemon Creek Trail to Juneau. Drive to Atlin, BC. There are numerous options for getting from Atlin to the beginning of the icefield, see the Access section below. 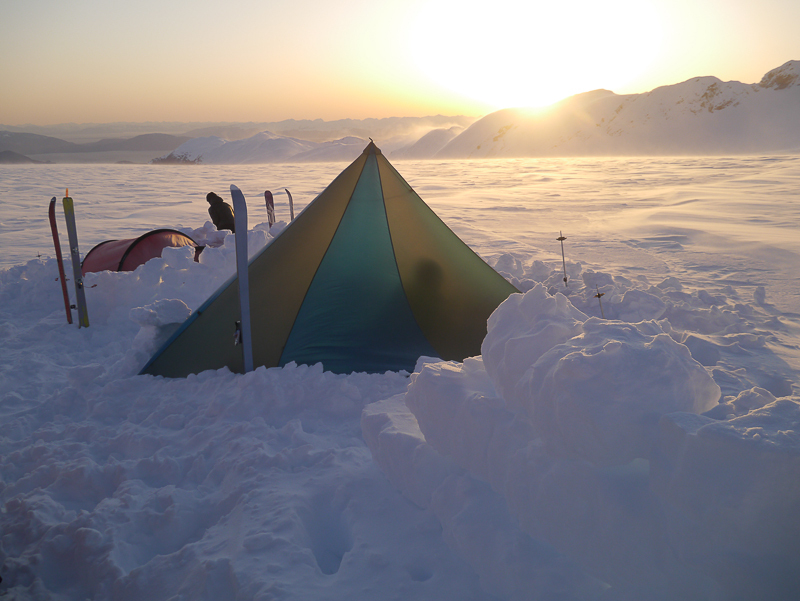 Variable weather and snow conditions, as well as how far you want to ski each day, will determine where you will be camping, so camping spots have been left out of the description below. For the most part, you can literally camp anywhere along the route. 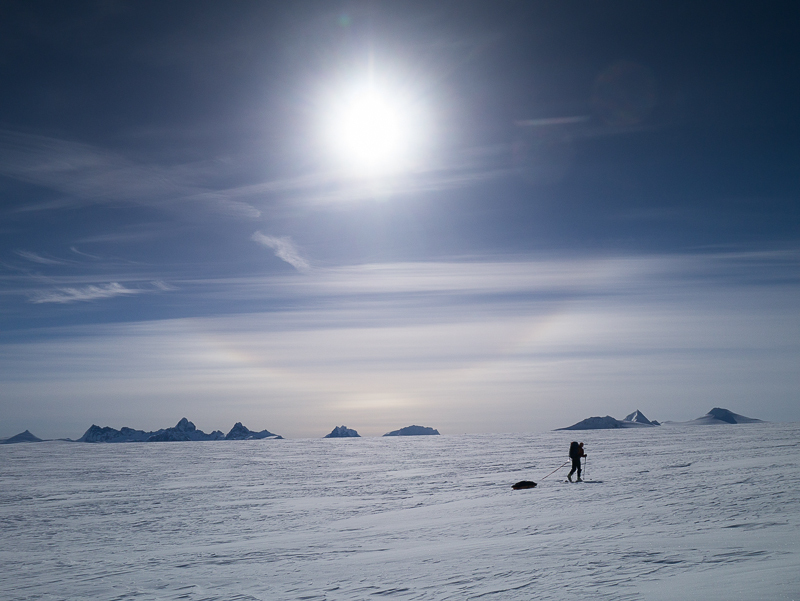 The description below is separated into sections for each glacier, as these will probably be your milestones when traversing across this large landscape. A GPS, compass, and maps are a must for this trip. 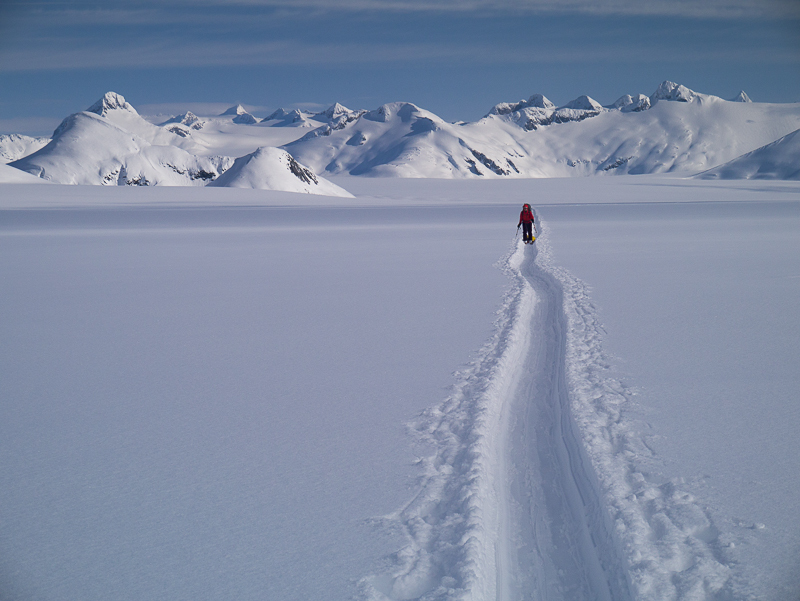 You can download and print the 1:50,000 and the 1:100,000 Atlin to Juneau Ski Traverse Maps, provided by Dendrite Geoscience. 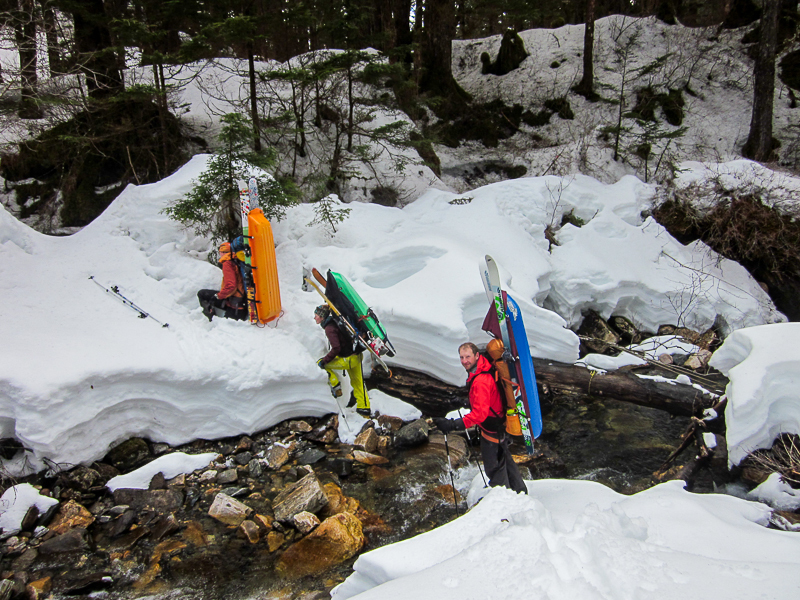 Skis are, of course, necessary on this traverse. 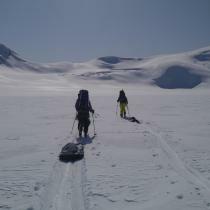 You can use either nordic touring skis or AT skis. 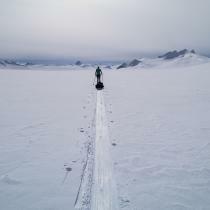 A pulk is definitely well suited for this traverse. Check out instructions on making a lightweight pulk on John Baldwin's website. 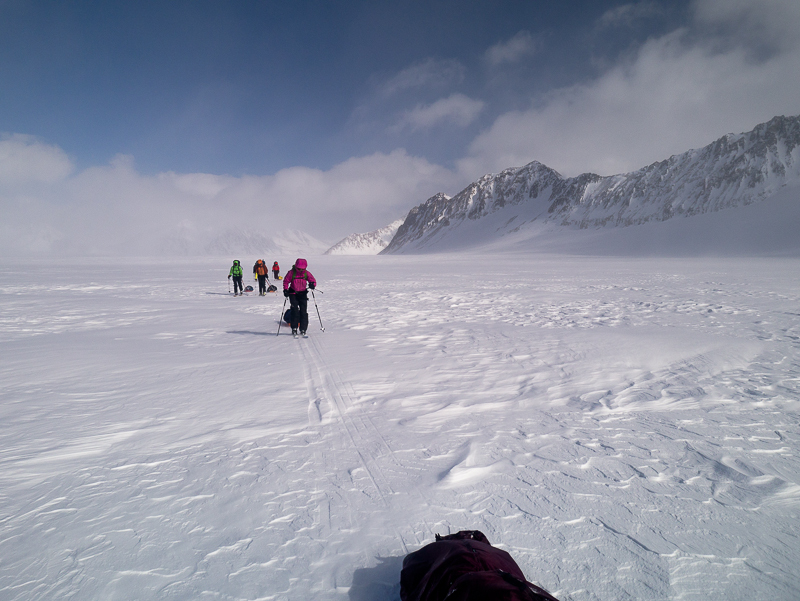 You may also want to bring a rope (and harnesses with crevasse rescue gear) for Echo Pass. 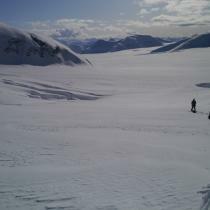 You can ski, snowmobile, or boat (in the summer) across Atlin Lake from Atlin to access the Llwellyn Glacier. 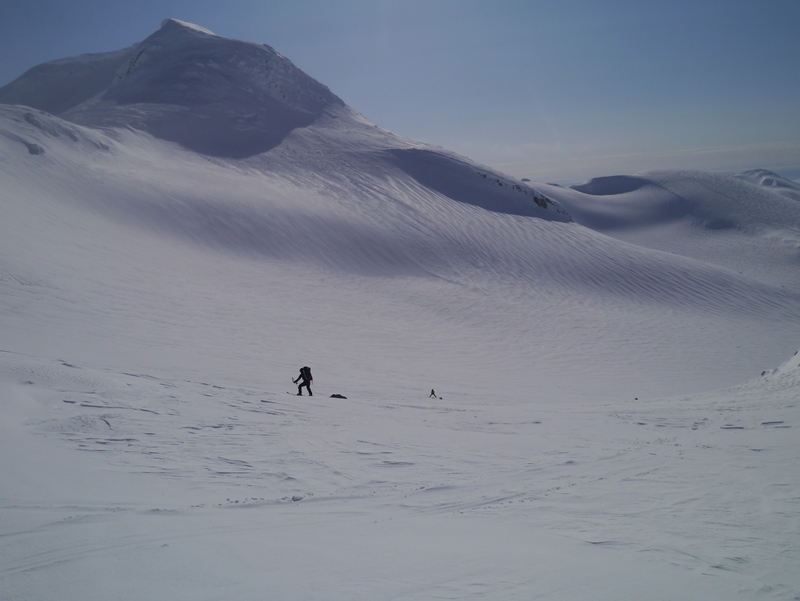 A popular access point is from Willison Bay, accessing the icefield via Hoboe Creek. If you plan to leave from Atlin, add an additional ~90 km to the total distance. 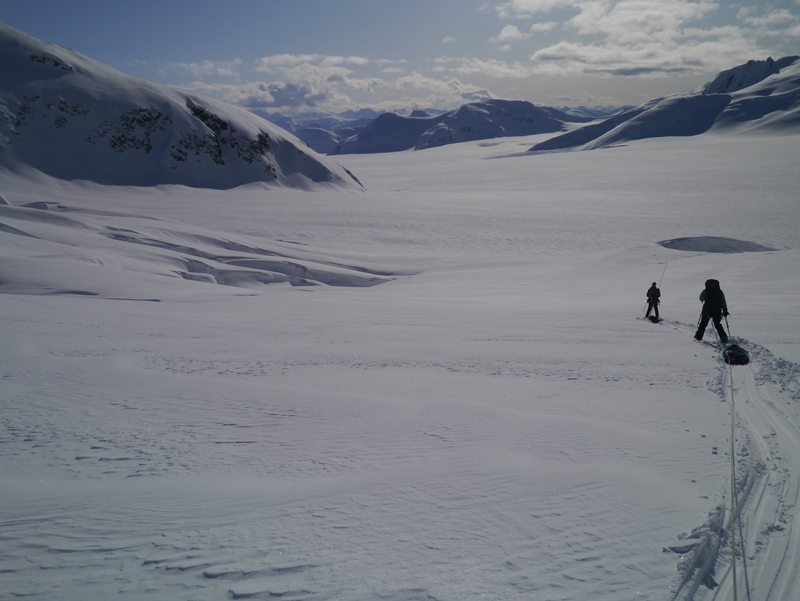 The quickest way to access the icefield is to fly from Atlin and land on the Llewllyn Glacier. 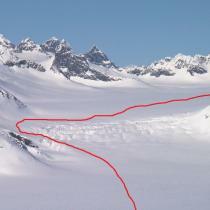 The route described below is based on flying onto the Llewellyn Glacier just south of the Llewellyn Nunatak. 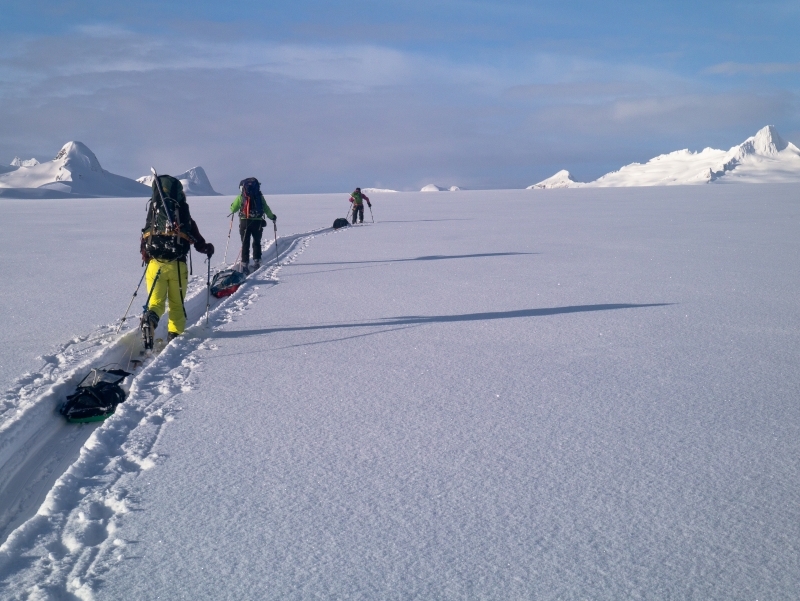 The ski traverse starts out on the Llewellyn Glacier south of the Llewellyn Nunatak. Heading south for 13 km, the route starts out gradually uphill for a short while and then flattens out. There is a nice downhill section as you head slightly more southeast now towards two nunataks (around KM 19), which you can ski between. 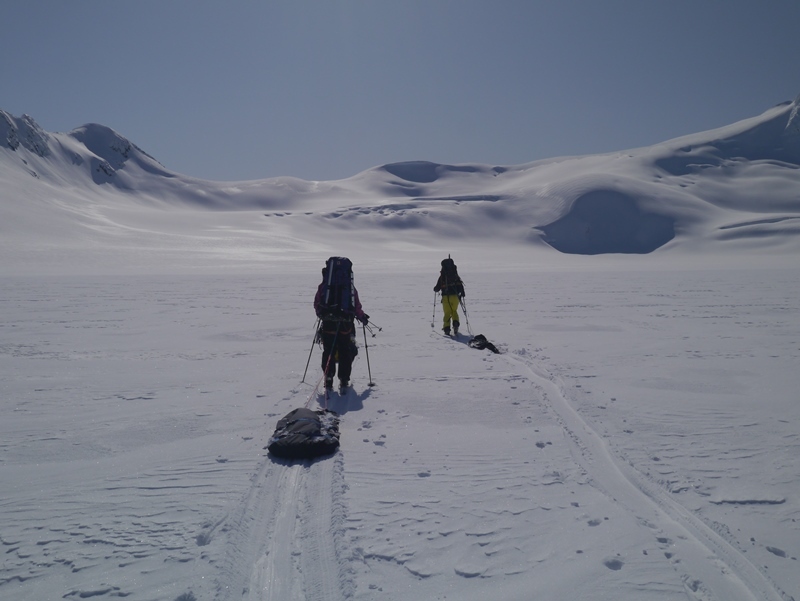 After 'rounding the corner' from these two nunataks, you will start to get beautiful views of Blizzard, Typhoon and Gale peaks as well as Mount Ogilvie to the southwest. Continue south from here as you head towards the BC/Alaska border. The terrain is very open and bowl-like. You can either stay high and traverse across the slope of the bowl on the right, or head down to the flat plateau below. 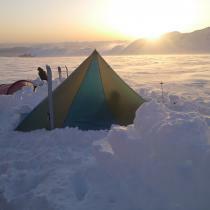 Shortly after you cross the border at around KM 25 you are on the Matthes Glacier. The Elephant Promotory is a good landmark to the southeast. 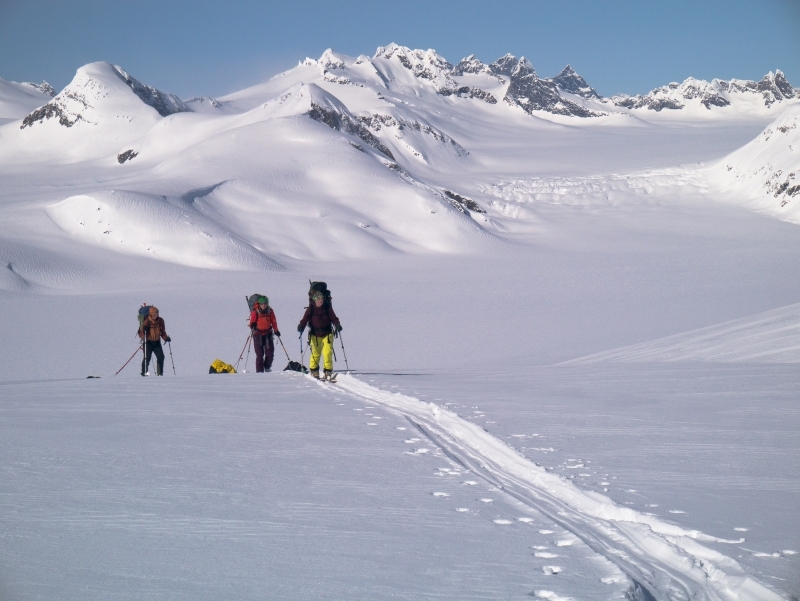 Continue south on the Matthes Glacier, which heads gradually downhill, passing by the Spirit Range to the west and Citadel Peak to the east, eventually leading towards Exploration Peak, where the Matthes meets the Taku Glacier (KM 43). 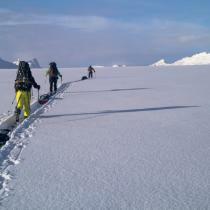 Follow the Taku Glacier southeast towards Juncture Peak. 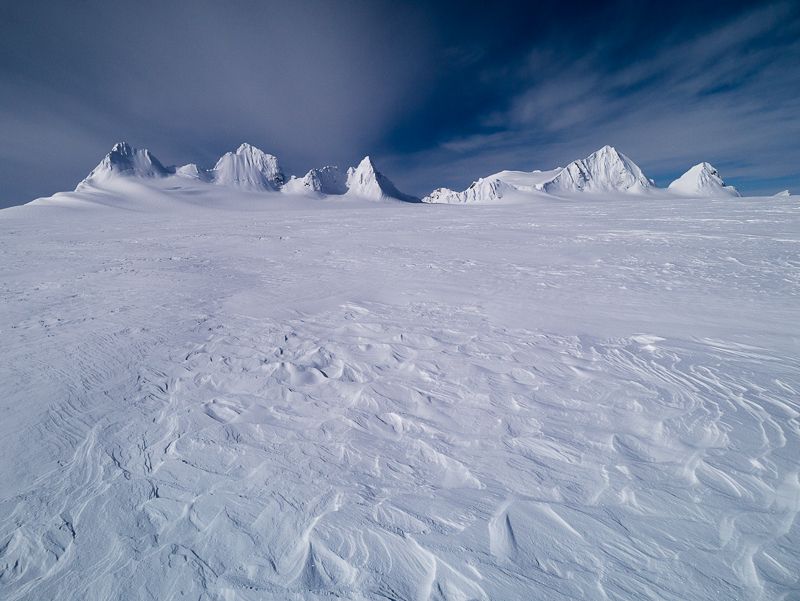 There are some stunning peaks bordering along the wide expanse of the Taku Glacier, with names like Flower Tower, Little Matterhorn, Cathedral Peak and the Taku Towers. At Juncture Peak (KM 54.5) the Taku Glacier splits into several branches, take the Southwest Branch, which heads gradually uphill. 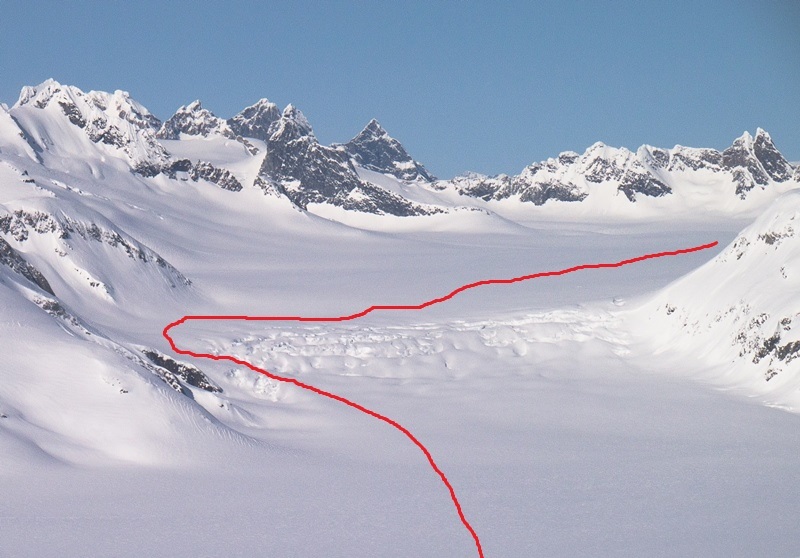 Note there are some small crevasses near Juncture Peak where the glaciers intersect so avoid going near any convexities or concavities, sticking to the most gradual terrain. On a clear day as you ski up the Southwest Branch, you should be able to look back to the gnarly black rock of Devils Paw (2,593 m), an impressive peak to the northeast which lies back on the Alaska/BC border. Slanting Peak is another beautiful mountain which lies to the southeast. You will follow the Southwest Branch of the Taku Glacier for just over 13 km as you gradually climb to Echo Pass (1,240 m, KM 67.5). 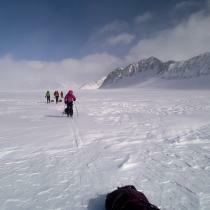 Echo Pass marks the beginning of the main crevasse field on the route. This is the only place you may want to rope up along the trip. 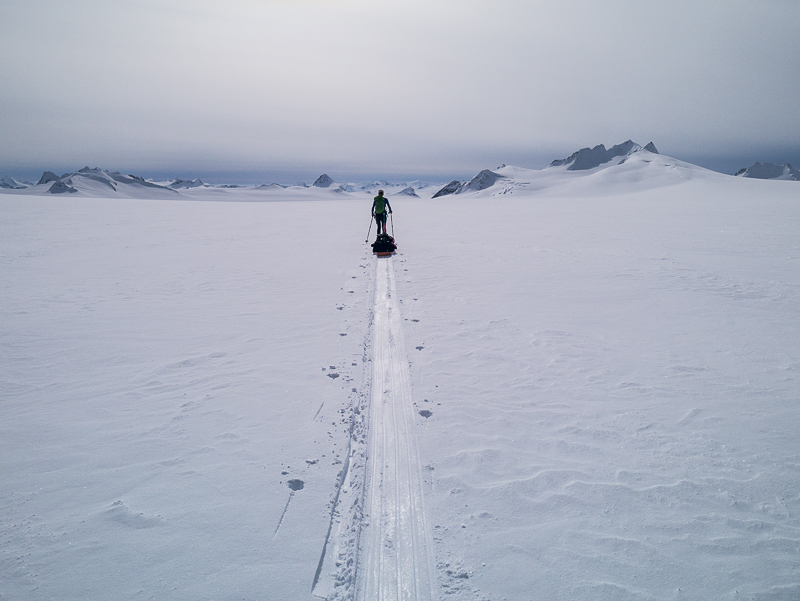 There is an easy route through the crevasses, if you stay on the right (west) side, heading towards the mountain side, and then curve around and down through the crevasses (still staying slightly to the right). You will then ski down to Death Valley and directly south across it (3 km) towards the base of the mountain pass northeast of Nugget Mountain. 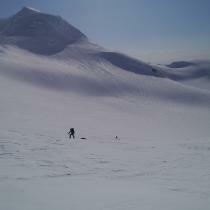 There are some crevasses on this slope which you can easily avoid by staying to the left. From the pass you will head up towards Nugget Mountain following around the left side of the two small peaks to an open ridge top (1,396 m). Heading southeast on the ridge top towards Split Thumb (a prominent mountain in the area) you will get your first glimpse of the ocean towards Juneau. A bittersweet sign that you are nearing the end of the trip. From here the route descends down a small offshoot of the Lemon Creek Glacier. This is the first main downhill section along the route and does involve travelling through some avalanche terrain, so pick your descent route according to conditions. Once down the slope you are on the main part of the Lemon Creek Glacier. Now that the fun downhill section is over, it's time for more uphill as you head south up the Lemon Creek Glacier towards Vesper Peak, Cairn Peak and Observation Peak. 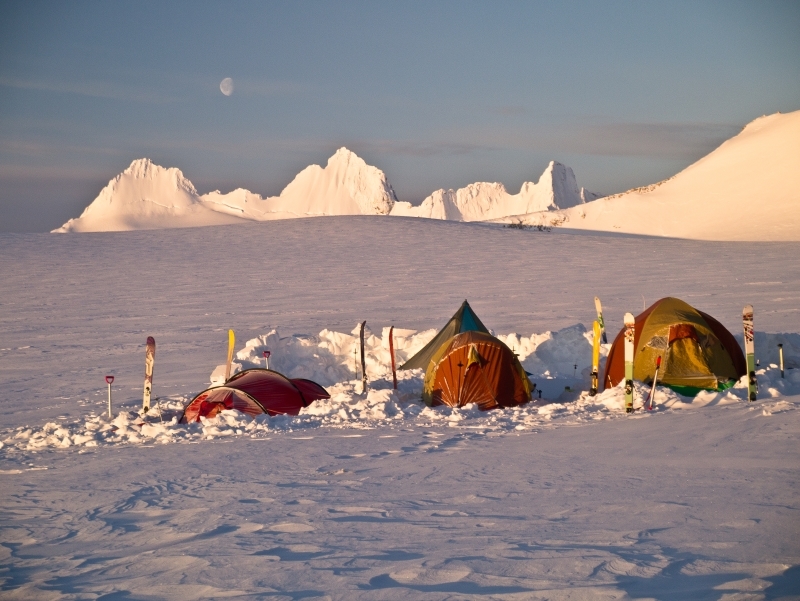 The aim is to reach the small saddle on the ridge between Vesper Peak and Cairn Peak - this is where the Juneau Icefield Research Program's (JIRP) main field camp is located (Camp 17). The field camp typically runs from late June to mid August each year, so many of the buildings are locked up in the winter. An outhouse and small bunkhouse are typically left open for winter users, but you will likely have to dig them out to get in. 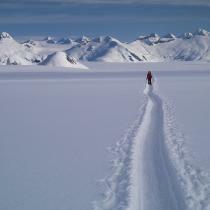 This is a good base for accessing both trail options down into Juneau. The Lemon Creek trail is a longer route into Juneau (~12 km), and the trail can be difficult to find in the winter and early spring. You may encounter steep icy sections through the forest and endless bushwhacking through Devil's Club if the trail is hard to find. Route finding and map reading skills are a necessity. To access the Lemon Creek Trail from the JIRP Camp 17, drop down to the Ptarmigan Glacier and follow it down towards the end of the glacier. On the map you will see two small lakes just west of the glacier valley. Hike up to a small pass which then heads down towards the smaller of the two lakes (to the north). At the end of the lake you can start seeing down into the valley. Descend, but stay to your left (south), aiming towards Canyon Creek. You will enter the trees at this point, but the route becomes more difficult to find. Aim towards the confluence of Canyon Creek and Lemon Creek. This will involve bushwhacking with your skis on your back. There are a few steeper sections at this point, and there may not be any snow at the lower elevations, making the route rocky and slippery (you may need to tie a rope around a tree to descend safely). 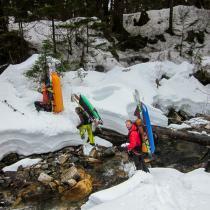 After crossing Canyon Creek, roughly follow along the south side of Lemon Creek all the way to Juneau. You'll possibly lose the trail now and again, which will make bushwhacking necessary. Eventually the trail becomes more trodden and will become easier to follow. You will come to a point near the end of the trail where you might see vehicles and a dirt road across the creek. You can either follow the Lemon Creek trail all the way, or cross the creek at this point and follow the road out. The trail ends at the end of Commercial Boulevard, near Home Depot. Either way, it will probably be the last time you try the Lemon Creek trail option. 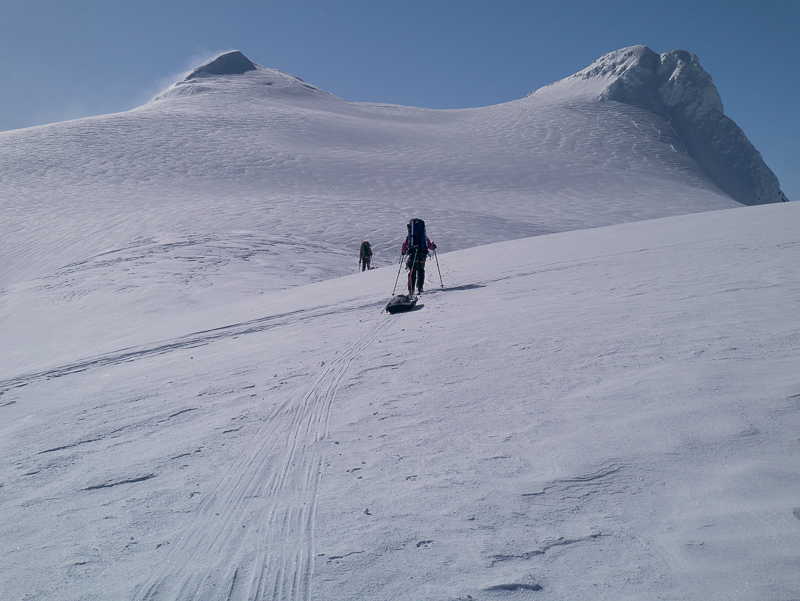 Blackerby Ridge is the preferred route off the glacier and into Juneau as it is shorter and more direct (~5.6 km). 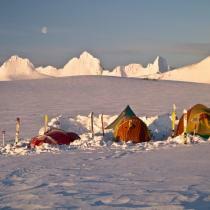 To access Blackerby Ridge from the JIRP Camp 17, climb up and over Cairn Peak (to the south of the camp). Note that you cannot access Blackerby Ridge from the col to the west of Cairn Peak - it is too steep on this side and there is a valley in between the col and Blackerby Ridge. 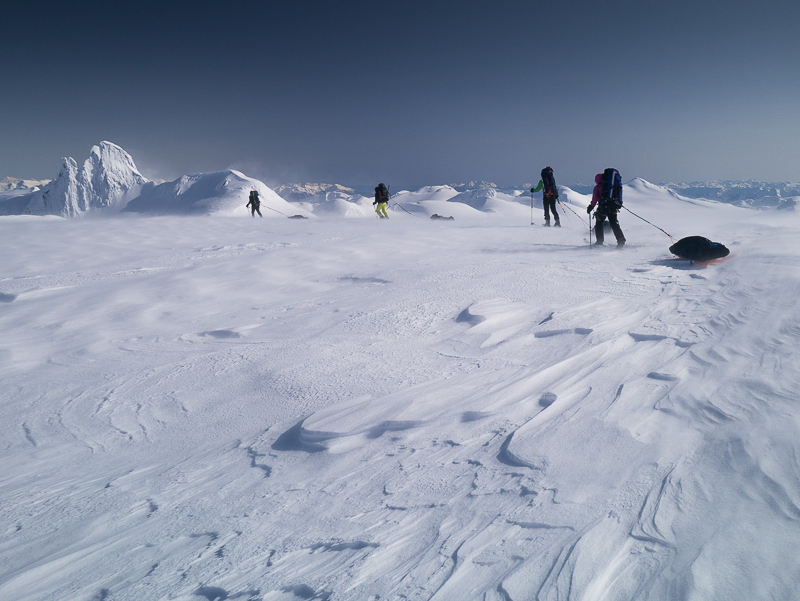 Descend from Cairn Peak onto Blackerby Ridge and follow it all the way down into Juneau. The trail may or may not be visible in the alpine, depending on the snow conditions, but a trail does lead through the trees. It is steep with no switchbacks. This route drops you out onto Greenwood Avenue, off of Wire Street. 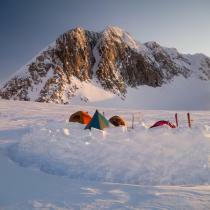 Another alternative is to call for helicopter pick-up from the JIRP Camp 17 or off the Lemon or Ptarmigan glaciers. A satellite phone would be necessary as you are still not in range of the cell service at this point. 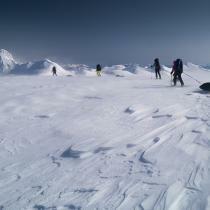 Have you been to Atlin-Juneau Icefield Traverse lately? Just finished this route a few days ago, and thought I’d share a few things about it. This is a 2-day exit. If you try to make it in one day, you’ll be sadly disappointed, so plan accordingly. It is rough going once you drop into the trees. The GPS tracks here are helpful for sure, but keep your eyes open for flagging tape. It’s there somewhere! The GPS tracks provided ended at what is now a construction site on private property. You can cut back into trees and pick the trail back up, or cut to the other side of the creek and take the road out. Once you get into Juneau, it is expected that you contact border patrol immediately. They have an office at the airport and one downtown. Our group had emailed photos of our passports to a border agent prior to crossing, but they really want people to contact them right away. In a few of Marko’s pictures, you’ll see a blue and gray Black Diamond megamid tent. This is an absolute must on this trip. 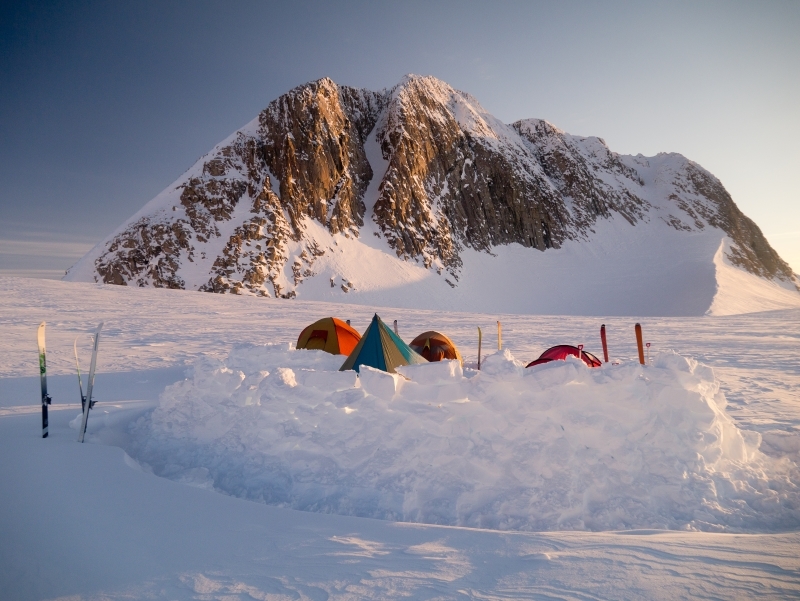 After a long day on the icefield, you’ll cherish a few hours with your group in this tent, comparing blisters and planning the days ahead. Highly recommend tracking one of these down before your trip. Pack as light as possible. Forget that pack of cards or book you think you’ll have time reading. Keep it light as possible, and pack at least 3 pairs of gloves. I brought a bivy sack for inside the tent, which was helpful when the weather got wet. 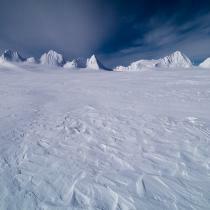 The USDA has a map that outlines the entire icefield. It’s great to have when looking at how far you have to go. There’s a small rounded building that is open all year round. If you get to this building and there’s ice on the roof, scrape it off right away or you’ll spend the night getting dripped on as the ice melts. 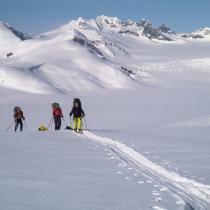 The people at the Juneau Icefield Research Project are very helpful with tips and weather links. Contact them if you’re heading that way. They’re happy to share wisdom regarding the ice fields. Jamie Tait of Summit Air dropped us onto the glacier. Solid pilot. Fair rates.